Cockatoos instinctively love shower time. Because of their white feathers, cockatoos can show dirt more easily than other types of parrots. Fortunately, cockatoos also love taking showers, as they are instinctively reminded of the rain in their natural habitat. Once your bird is used to the shower, he'll love his trips to the bathtub. Attach your shower perch to the wall in a room where your cockatoo is already comfortable, like your living room. Introduce him to the perch and over the course of a few days, allow him to become accustomed to using it. Train your cockatoo to go into the bathroom with you. Allow him to perch on you as you walk around, and practice entering and exiting the bathroom and the shower. Attach the shower perch to the shower wall. If your shower perch attaches using suction cups, make sure that they are secure, because if it falls while your bird is perched on it, he may be apprehensive about using it again in the future. The perch should not be in the direct path of the water, as most cockatoos don't want to be completely saturated. Set your shower head to a misting setting, which is gentle and reminiscent of a tropical rain. If your shower head does not have a "mist" setting, set it to its lowest setting. Turn on the shower with warm, not hot, water. Bring your cockatoo into the room and allow him to move onto his shower perch. He will take care of the rest, as cockatoos don't generally need soap. They are coated in a self-created dusty powder down that collects dirt, which is then washed away by the shower. Once your bird appears finished with cleaning himself, turn the shower off. He does not need to be dried by you, as his feathers do not retain much water and he prefers to shake himself dry. Shower your cockatoo in the morning, so that he can dry off throughout the day's activity. Shower your cockatoo once or twice a week. 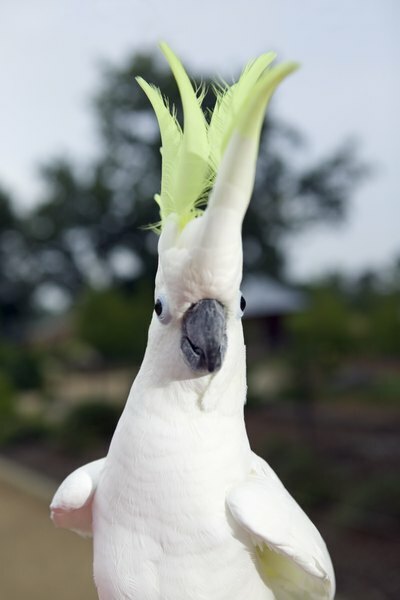 What Is the Thing on Top of a Cockatoo?